Apricot is a small tree, 8-12 m tall, with a trunk up to 40 cm in diameter and a dense, spreading canopy. The leaves are ovate, 5-9 cm long and 4-8 cm wide, with a rounded base, a pointed tip and a finely serrated margin. The flowers are 2-4.5 cm diameter, with five white to pinkish petals; they are produced singly or in pairs in early spring before the leaves. The fruit is a drupe similar to a small peach, 1.5-2.5 cm diameter (larger in some modern cultivars), from yellow to orange, often tinged red on the side most exposed to the sun. Its surface is usually pubescent. The single seed is enclosed in a hard stony shell, often called a "stone", with a grainy, smooth texture except for three ridges running down one side. The apricot was known in Armenia during ancient times, and has been cultivated there for so long it is often thought to be native there. 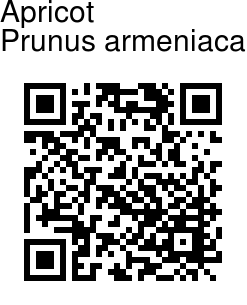 Its scientific name Prunus armeniaca (Armenian plum) derives from that assumption. 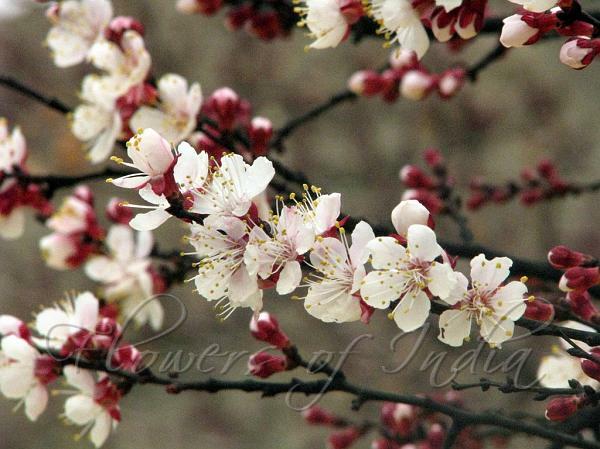 Some believe that it was cultivated in India in 3000 BC. Identification credit: Abdul Rahim Photographed in Ladakh & Himachal Pradesh.